Major General Michael D. Dubie is The Adjutant General of the State of Vermont, serving as the senior uniformed officer in the state responsible for the organization, training and equipage of nearly 4,000 members of the Vermont Army and Air National Guard. General Dubie also serves as inspector and quartermaster general and head of the State Military Department, including Veterans Affairs, responsible for a combined state and federal budget of over 210 million dollars. General Dubie began his military career in 1979 in the Army Reserve Officer Training Corps program at the University of Vermont and simultaneously joined the 150th Aviation Battalion in the Army National Guard. He was commissioned as a second lieutenant, Armor Branch, in 1981 and later transferred to the Vermont Air National Guard. 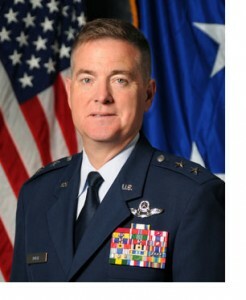 General Dubie held a variety of command, supervisory and staff positions at the 158th Fighter Wing and Vermont State Headquarters and served as the Assistant Adjutant General responsible for the Vermont Joint Staff and Joint Forces Headquarters. Additionally, General Dubie commanded the 447th Air Expeditionary Group at the Baghdad International Airport and served as Director of Staff for the 332nd Air Expeditionary Wing, Balad Air Base, Iraq. General Dubie is a command pilot with over more than 2,000 flying hours in trainer and fighter aircraft. 2007 George Washington University, Elliot School of International Affairs, National Security Studies Program, Washington, District of Columbia.